Julius Caesar said experience is the best teacher in 100 BC, and that’s still painfully true, thousands of years later. For today’s entrepreneurs, launching a new business or promoting an innovative idea can be an extremely challenging experience. As you navigate your own entrepreneurial journey, it helps to hear advice from other business superstars who have fought their way to the top. 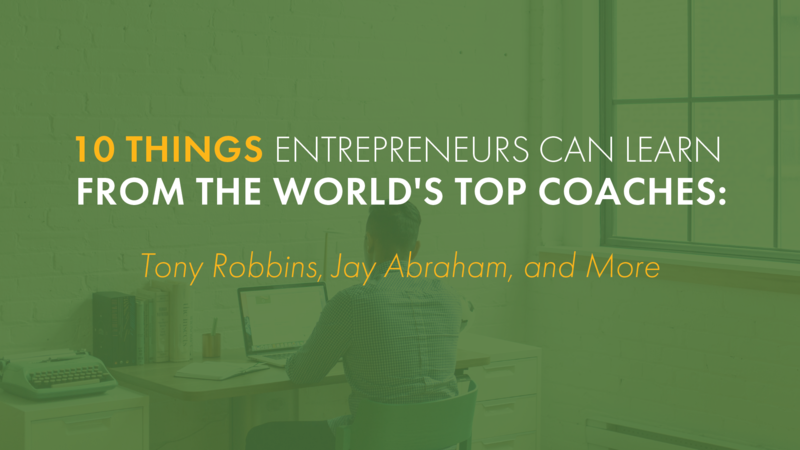 Here are 20 things you can learn from some of the world’s top coaches. Tony Robbins never went to college or had any formal business training, but he made his first million by the age of 24. He told Entrepreneur magazine that one of the things that has made him successful is being brutally honest with himself about his own strengths and weaknesses. Never lie to yourself, and never lie to others, Robbins says, or you’ll never be proud of your own success. Robbins also believes vague goals kill the prospects of entrepreneurs, and ultra-specific goals help them thrive. As an example, he talks about how kids are often better than their parents at video games. It’s not because they’re naturally smarter or faster. They just play more often. They develop crystal clarity about the goals of the game, and they begin to anticipate the movements involved. Entrepreneurs can do this too, in the real world. Neil Patel is a young entrepreneur who founded Kissmetrics and Crazy Egg before the age of 30. He’s famous for having made - and lost - a million dollars, and sharing his wisdom with millions of followers. Patel says grit is his secret weapon: hard work, perseverance, and the ability to work even harder when people are telling you to give up. Patel is also a big fan of finding a co-founder to help you launch a business - and he has statistics to back it up: 20% of startups with 1 founder succeed, and 47.5% of startups with 2 founders succeed. Being an entrepreneur demands long hours and a robust set of skills. By doing it together as a two-person team, you blunt the impact of these challenges. Jay Abraham founded The Abraham Group and has helped thousands of businesses across hundreds of industries revitalize their companies. As he said in the CEO Warrior Podcast, one of the main battles an entrepreneur will fight is the battle against inertia - allowing things to happen to us, rather than making things happen for ourselves. Abraham advises entrepreneurs to act strategically and with bold confidence. Abraham sees many entrepreneurs who keep doing the same thing over and over, whether its the right thing or not. Instead of digging holes, ask yourself questions like, “Should I be digging a hole? Should I be digging there? What tool should I be using?” This is the only way to step out of the hole and go a new direction. Legendary football coach Jimmy Johnson was invited to speak at the Miami Entrepreneurs’ Organization about what it takes to put together a great team. He told a story about an NFL player who partied hard one night and was a mess on the field the next day. He asked the player, “Was your night out good enough to risk your teammates’ dreams?” No. Never put your personal interests above those of your business, when the team is depending on you. A member of the Forbes Coaches’ Council, Jessica Glazer helps entrepreneurs at the Center for Creative Leadership. She shares the wisdom of psychologist Tal Ben-Shahar, who believes in the concept of “beautiful enemies” - listening to people who are willing to push back on you and share hard truths. Glazer advises entrepreneurs against surrounding themselves with yes-men, who will only parrot back their own ideas and prevent genuine growth. Ascension CPAs & Consultants is a full-service firm that offers CPA services, consulting, and financial support for entrepreneurs. We charge on a 100% flat monthly basis, providing total clarity in billing. We can reduce the tax burden you face and provide business consulting with a personal touch. Call 405-759-2796 or use our contact form for a free consultation.